March 5 of this year is Ash Wednesday, marking the beginning of the season of Lent in the Christian calendar. Lent offers us space to reflect on our sin and Jesus’ sacrifice on our behalf. Through fasting and other acts of penitence we come to terms with our need for God’s grace. During these forty days we repent of our sins so we can recommit to God’s mission in the world. Observing Lent is a deeply personal experience, but it runs the risk of becoming private. We have to acknowledge our families, communities, and churches need to repent as well. Recently I learned about a growing practice of communal Lent observation using readings, prayers, and candles. The idea is not that different than the wreaths of candles used during Advent. Whereas Advent begins in the dark and we light another candle each week until Christmas representing the growing presence of Jesus, the Lent candle cross begins fully lit and each week we extinguish another candle as we move toward Good Friday. This growing darkness reminds us we had Jesus physically with us, but we rejected and killed God incarnate. We tried to snuff out the light of the world. 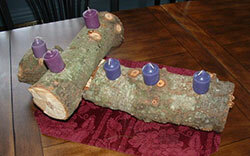 A Lenten candle cross is easy enough to make. It has places for six candles, one for each Sunday in Lent. The first Sunday begins with all six candles lit, the second Sunday with five lit, and so on. My church is going to include this observation during the season and I have written some readings and prayers for our services. I have included these readings and prayers in a PDF. Feel free to use them and adapt them however you wish. Just don’t sell them.